Mutations that impact on cardiac electrophysiology have been of scientific interest throughout the last decade. By altering specific ion channel characteristics, these mutations are associated with a high risk for the development of ventricular arrhythmias and sudden death. Although DNA analysis has enhanced our understanding of the underlying processes, inter-individual differences impede to quantitatively predict the effects of the mutated channels on the ECG. 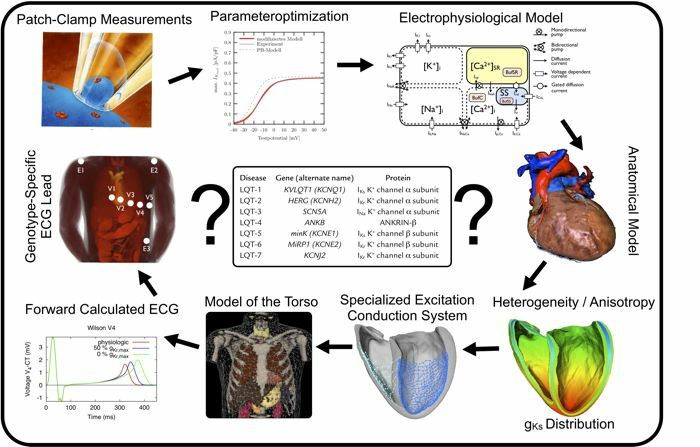 mathematical models of cardiac electrophysiology, the excitation conduction on the individual cardiac anatomy is simulated. To this end, a patient-specific endocardial stimulation profile is created that mimicks the role of the excitation conduction system and enables a realistic depolarisation sequence. A subsequent forward calculation allows the determination of electrical signals on the body surface and the extraction of standard ECG leads. For verification and optimization of the computational model, this calculated signal on the body surface is compared to 64 channel ECG recordings from patients. Effects of the sympathetic nervous system are included into the computer model of the LQTS as heart rate and adrenergic regulation influence ion channel characteristics and thereby cardiac activity. As cardiac repolarization depends crucially on heterogeneous ion channel distributions they are integrated into the electrophysiological model as well. Especially the differences of the T wave morphology between the genotypes of LQTS will be used to derive ECG electrode positions that allow a new ECG-based discrimination of the mutation genotype.